In the LINK-GIS Map Viewer, hover on the gray box with white stacked squares on the upper right of the viewer. The hover text reads “More Layers”. When clicked, it expands, showing several groups of map layers that can be turned on and off.. The Survey Monuments layer for Kenton and Campbell Counties are in the “Monumentation” group. Check the box next to the “Monumentation” group layer name to turn on the map layer. The monumentation locations are symbolized by orange circles with a black cross hair. Click on one of the orange circles to open a pop up window to view the monument designation. The pop up window also contains links to view the datasheet, NGS datasheet and reconnaissance photo for the monument. * Please Note: the Pop-up Blocker will need to be turned off to view the linked datasheets and photos. Click on the respective link to open the information. Users can also report a missing or destroyed monuments by clicking on the “Report a missing or destroyed monument” link in the pop up window. The link will send users to the Control Network Recovery Form. Fill out the information and submit. * Please Note: the Pop-up Blocker will need to be turned off to view the linked website. If the pop up window shows parcel information, zoning information or something else, simply click the white arrows on the top of the pop up window until the monument information is shown. 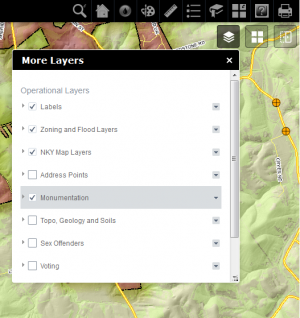 To turn off the Survey Monuments layer, uncheck the box next to the “Monumentation” group layer name.